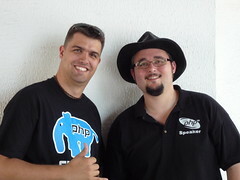 So I recently got back from Brazil, where I was asked to Keynote at the 2009 PHP Conference Brasil. 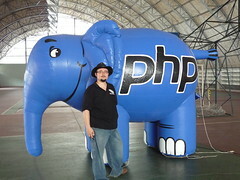 It was a great experience and I’ve written up my experiences and feelings about the conference itself over as a PHP Conference Brasil Wrapup blog post on Zend’s DevZone. But the point of this post, is just to talk about the amazing experience of being in Brazil, and what our feelings were. You see, the conference was during what would have been Thanksgiving vacation for me, so I went there for the whole week before hand to act as my replacement Thanksgiving and brought my wife (Heather) with me. We sent our son to Camp Gramma for the week. Because of where the conference was, we stayed in São Paulo, which depending on which chart you look at, ranges from being ranked the 3rd largest city in the world, down to the 7th. I’ll state that São Paulo has a plethora of Tourist things to do, but isn’t really a tourist destination perse. Don’t get me wrong, we did plenty of things and had a great time. 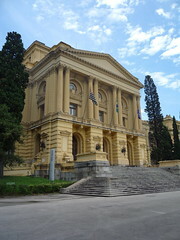 Saw a number of museums, lots of great historical cathedrals and more. But really the primary tourist attraction for us, was just in experiencing the completely different culture, and being in, essentially a 3rd world country, though taking great leaps and bounds to break out of that. One of the biggest ‘attractions’ that we experienced, was the traffic. It seems that traffic is a major problem in São Paulo, as it regularly took 1-3 hours to get from location to location. We’d often end a day feeling very accomplished that we hit 2-3 different sites that day. But afterwards were realizing that in a tourist town, you’d have hit 10-15 in that same timeframe. Imagine going to DC where instead of being able to walk from museum to museum, and go easily from the White House, to the Capitol, to Washington and Lincoln memorials in a day if you wanted. To having each of those locations be hours of car traffic apart. This was coupled with the fact, that since we needed a ride to get back to our hotel, and that São Paulo was so big that we needed to get back home at a decent time every night, instead of heading out to any night spots. Plus where we were staying (Osasco) really didn’t have much around it (ok, at all), so when we were left back at the hotel in the evening, all we really had was the minibar, and a nice pizza restaurant downstairs in the lobby. The language barrier was actually pretty formidable. Before going there, we had studied up on some basics of the language, but all the tourist guides we read were stating that 1/3rd of the people (at least) spoke English. Well, perhaps 1/3rd do, but not the 1/3rd we ran into. Things were translated into English all over. But it was rare to run into someone who spoke english. Only 1 waiter and 1 bar tender at our hotel (a Best Western) spoke English. Noone at the front desk spoke it well, only a couple people who spoke it very haltingly. As we went around playing the role of tourist, we found very very few places that had English speaking hosts or help. Primarily at the high end restaurants. I will say we got quite a few stares as we were walking around speaking English all the time. 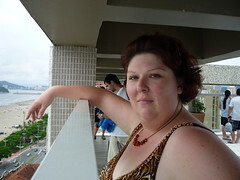 What made it worse, in a way, is that the Brazilian people are VERY friendly, and really try to be helpful. But that actually made it worse. Because any time we tried to buy something (food, souvenir, etc), they wanted to ask us all sorts of questions, about what other things we want to buy, what options in payment we have, etc. In the US, you are lucky to get a cashier to even consider speaking to you. Hold up your merchandise and a Credit Card, and the most you are likely to hear is: “Sign here”. One particularly funny (to me at least) incident revolved around me trying to order 2 Big Macs at a McDonald’s at a mall, while hanging out with the PHP Community there and drinking. (Yes, they have bars in the mall). I walked up, and said: “Dois Big Mac” and proudly held up 2 fingers to drive it home. What ensued was I’m sure a great comedy routine, as she tried asking me something. I kept alternating between “Dois Big Mac” and “Inglês?” while trying to get her to understand that I just wanted 2 Big Macs, and that I only spoke English. 10 minutes later, she finally rung me up, and gave up on whatever she was trying to ask me. In general whenever we went to try to converse with someone (Heather and I spent one day, and a few evenings by ourself, exploring), the reaction when we would respond with: “Inglês?” was laughter. Not ‘we are laughing at you’ type. But a more nervous chuckle of “Oh boy, a tourist, here, and I don’t know English”. The funny thing is, they didn’t try to come up with physical demonstrative ways of expressing concepts after that as one would expect. Pointing at signs, holding things up, etc. Instead they KEPT trying to speak Portuguese to us, and I swear they were doing the: “If I say it louder, and slower, they’ll understand me” trick. There was also a healthy bit of ‘danger’ on the trip as well, that made it a little less exciting as it could have been. I had a number of friends down there, and everything was couched with a statement of: “Oh, but please don’t walk there at night”, or “Don’t go there alone”. It seems that crime is a major issue in São Paulo and combining that with our inability to communicate, made it hard to just get around to do things. We shouldn’t walk places, nor come back too late on the Subway. But at the same time we couldn’t easily take Taxi’s or other public transit either. It made for some frustration that we were locked into our Hotel, all sorts of great things around for us to see, but no way to do it. Especially since we had a US Citizen’s point of view on things, that we wanted to rush to see as much as possible. That in itself is very different from the Brazilian attitude. People are actually very laid back there. They show up when they are ready, they take their time with things. Meals are long experiences to be savored. In fact at a restaurant they rarely bring you the bill until you ask for it, stating that you are done eating. Otherwise they don’t disturb you. In a US restaurant, they are trying to get you out of that seat as soon as possible to get someone else seated. The food was excellent though, especially the beef, which was prevalent and cheap. I had my first experience eating ‘hump’, as the beef there comes from Brahma cattle. They also have a strong Italian influence making great pasta dishes abound, and pizzerias the #1 restaurants. I do admit, they made some amazing pizza. We experienced a number of markets, ranging from the ‘Little Tokyo’ one, to the arts fair at Embu, to walking downtown through a massive shopping fest that filled the streets. It was exciting, but at the same time, except for some few select items, shopping didn’t play a big role, since most everything there cost more than it does at home, even taking into account the fact that we had essentially a 2:1 exchange rate that was very favorable to us. I will wrap up this rambling discussion, with a quick anecdote that rolled much of the experience into one. Which was when I had a drunk Brazilian guy screaming Portuguese into my face, just inches from touching me. We were in a beer shop in the mall. (BTW, Bud lovers? You’d love Brazil. 98% of what is drunk there, the chopp (translation: draft) could be considered a Bud clone. It’s even made by the same company. I longed for getting back to the US and some tasty microbrews). Wait, I digressed. So we were drinking in the mall and behind us, some guys drinking from a 5 liter pitcher of beer got a bit animated, and hit the table to make a point. The table being rather flimsy, it rattled, and sent multiple classes crashing to the floor creating quite a mess. My wife and I were very surprised, specifically because noone seemed to think twice about this. The guys stayed there drinking and calling for more glasses. The wait staff ran over to clean up. We were talking about this with Rafael Dohms, our host for the week, and contrasting how that would be handled in the US. With the guy being tossed out immediately by the manager. It seems that we looked his way a few too many times, and so he came over to rant at us. There he was, screaming in my face, and not letting up. I turned to Rafael, who picked up the conversation. In the end, it seems, the guy spent 10 minutes yelling at us about how he is poor, and drinking is all that he has, and that he didn’t break our stuff, so why are we caring that he broke things. The whole time, the service staff (and the manager) just sat back at watched. The guy never got the hint that we didn’t understand Portuguese, and even at the end, spent a few minutes whispering into my wife’s ear and rubbing her back (it seems just repeating the same words about how he was poor, and these two rich guys couldn’t understand him). In the end, Rafael got the owner to waive the charge for our drinks, and we left as soon as we could. I do owe Rafael Dohms a huge debt of gratitude. He took the entire week off, to act as tour guide for my wife and I. We realize in retrospect that it’s amazingly good that he did so. The city was very hard (almost impossible) to navigate without knowing at least a smattering of Portuguese and we would have probably ended up spending most of the week paying really expensive prices to take long cab rides everywhere, or just sitting in our hotel the whole time not knowing what to do, had Rafael not offered to be our tour guide, and run us around to all the sites. We literally can’t thank him enough for that. Also, thanks to Ivo Nascimento (@ivonascimento) and Ivan Rosolen (@ivanrosolen) for picking us up at the airport. Anderson Casimiro (@duodraco) for driving us to the ‘Beach Day’ of the conference and back to the airport on our last day. 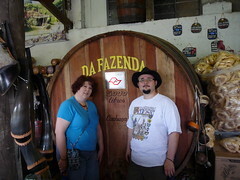 Augusto Pascutti (@augustohp) for helping me find/buy wine for my wife in a place surrounded by beer. Guilherme Blanco (@guilhermeblanco) for being the official evening event planner. Er Galvao Abbott (@galvao) for being an excellent conference host and inviting us down there. Alex Piaz (@zaip) for being a great conversationalist and fellow beer lover, and of course Tiscilla Dohms (@tiscilla), Rafael’s wife, for showing my wife a good time and becoming great friends. We look forward to going back to Brazil in the future (after all, we have 5 year visa’s now! 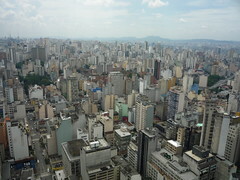 ), but we hope to make the next trip be somewhere other than São Paulo. Rio comes to mind, or the northern beaches. Perhaps some of the inner country resorts/springs. Until next time Brazil: Tchau! I’ll be presenting two talks: Highly Scalable Web Applications and The Knight Rider Methodology to Software Development. I also plan on participating in the Hack-a-thon that is being held one evening, for people to sit down and together work on enhancements to various Open Source projects, such as Zend Framework or Phergie. At DPC I’ll be giving the same talk as at PHP|tek: Habits of Highly Scalable Web Applications, plus a new talk: Code & Release Management. Looking forward to hopefully seeing a few of you there! So I sit here tonight, doing some preparations to start my job at Zend tomorrow morning. I took my family away to a resort for the weekend primarily as a present to my wife for her birthday. Though it also served as a celebration & transition from one job to another. Quite enjoyable even if we both left with neck/back aches because of the hard beds, and we had our gas siphoned off overnight. I’m looking forward to jumping into the new job tomorrow. To have some content in this blog post, I did want to point out a few new pieces of software I recently started using, somewhat in expection of needs of the new position. One is EventBox, which seems to be a great Mac application that pulls data from Facebook, Flickr, Twitter and others and organizes them together. The second is that I wanted a more organized way for keeping notes, after a few suggestions from friends (such as evernote and VoodooPad) I opted for simply using a local installation of DokuWiki. Primarily to stick to my PHP/Web roots, and I liked the idea that the notes were just stored as plain text files for ultimate portability. Well, this seems to be the worst kept secret in the PHP community by the mumblings that have been going on. So I think it’s time to confirm it. I’m extremely excited about this opportunity to work with Zend and to have the focus of my daily job to be working with the PHP community which I dearly love. I know that any attempt to fill Cal’s shoes will be met with failure, so I hope instead to come up with my own twist on the position and to give it my best. The job is one that wears many hats, but can be very roughly boiled down to: 40% engaging with the community, 30% writing & soliciting articles for DevZone, 10% coding, 10% podcasting, and 10% communicating information back to Zend from the community. My first day at Zend will be January 19th. I’m sorry to leave TravelPod behind as they are some great people; however, they understand this position is a once in a lifetime opportunity and that I don’t want miss it. You are currently browsing the archives for the Zend category.